Local government in England has become remarkably polarised over the last few years. Huge geographical divides have sprung up, if not overnight, then as a consequence of a series of election nights dating back a decade or so. First the Tories picked off almost all of Labour’s rural councils, relics of the rise of Tony Blair in the mid-1990s. Then Labour vacuumed up almost all of the towns and cities, thanks mostly to a collapse in Lib Dem support from 2010 onwards. 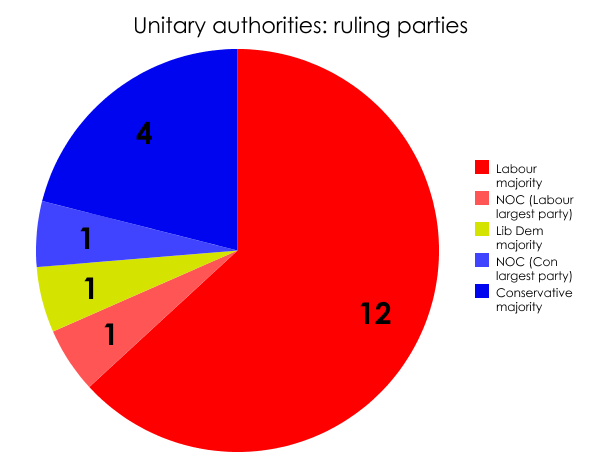 Labour is super-dominant here. Some of its 29 councils, such as Manchester, Liverpool, Sheffield and Newcastle-upon-Tyne, boast no Tories whatsoever. The four Labour minority councils are Bradford, Kirklees, Walsall and Calderdale, all of which Labour will be hoping to convert into majorities. The party would love to prise Trafford from the Tories, but they’d need to win an additional six seats to do it. They need 11 to take Stockport from the Lib Dems. Solihull is really the only one right out of Labour’s reach. 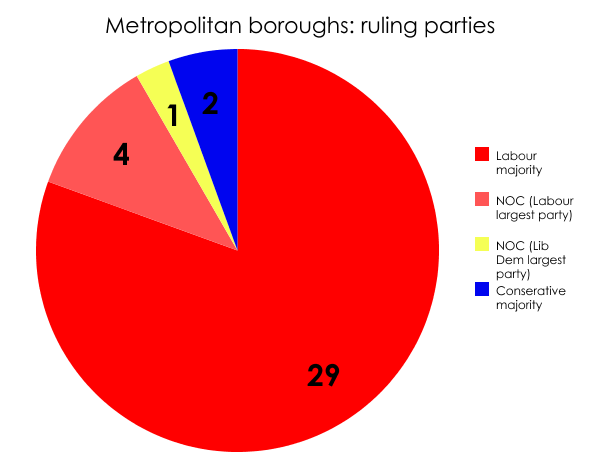 The Tories have a majority of just six, but the party is safe as there is no main challenger (Labour holds only six seats out of the council’s total of 51). This is a more mixed picture, as befits a category that includes cities such as Southampton and Derby alongside places like Southend-on-Sea and North East Lincolnshire. Labour has the upper hand – we’re talking councils like Halton, which I mentioned the other day – and will be hoping to turn Bristol from a minority to a majority. It could also tip Milton Keynes from a Tory minority council into one in no overall control, and possibly send Swindon (with its current Tory majority of one) in the same direction. Here’s where the roles are reversed. The Conservatives enjoy a dominance that will only continue and could well deepen. 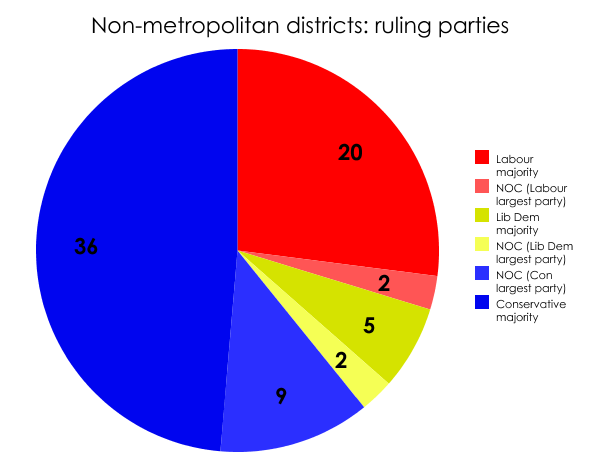 Of those nine NOC councils where the Tories are the largest party, four would become Tory majority councils on the merest puff of wind. These are St Albans, Gloucester, Hart and Basingstoke & Deane, where in each case the party needs to pick up just one more seat. The party needs an extra two seats to do the same in Winchester, and another five in Wyre Forest. It’s not all hopeless for Labour. The party ought to win Cambridge, one of the two Lib Dem minority councils, where it needs an additional three seats. The two Labour minority councils, Stroud and Worcester, should also turn into majorities. But we could see some Labour councils turning Tory. Chorley, Great Yarmouth and Redditch are all possible Conservative gains; Labour has a majority of just one in each. The Tories will also be aching to take the other Lib Dem minority council, Colchester – though they’ll need to win an extra eight seats. And I’m sure they’d be glad to be free of the Lib Dem coalition they’ve been enduring in Pendle. In short, be prepared for both major parties experiencing whitewashes and wipeouts in Thursday’s elections. I suspect only one party will perform consistently, and that’s the Lib Dems. Consistently poorly, that is.